How do you pay a fitting tribute to a man who has already had every kind of tribute paid to him from all corners of the planet? Journalists, sports fans, political leaders, have all lined up to sound off on the career of the greatest distance runner the world has ever seen. Perhaps the best I can do is to make a start by writing something from a personal perspective. Let’s go back to the beginning. In 1992 shortly after taking up “proper” training and joining the Wits University Athletics Club, I met there, amongst others including Hendrick Ramaala, one Philip Knibbs. Phil and I are still close friends today and in contact on an almost daily basis. Both still chasing PB’s, warding off middle-age, and loving running everyday. In 1992 and 1993 we got to know one another and the rest of the Wits running group. We got swept up in anything and everything distance running related. We soaked up articles in Athletics Weekly, Track and Field News, the now-discontinued SA Runner, and even, yes even, Runners World. We watched the World Junior Athletics Champs in 1992 and the World Champs in Stuttgart in 1993. I marvelled at Richard Chelimo, the Kenyan 10k star. 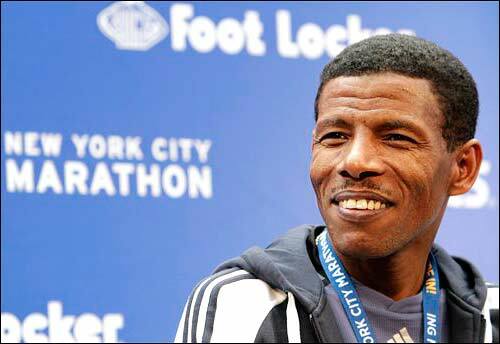 Phil picked out an Ethiopian youngster, Haile Gebrselassie, who we had seen the in the junior champs previously, as one to watch for the future. “I like the look of this guy” “I think he is one to watch”. From that day on, as far as we were concerned, Haile’s progress was intertwined with ours. He inspired and amazed us, and set benchmarks that others could only observe from a distance. He took care of business wining world titles from 1500m up to 10000m on the track, while we took care of business trying to set PBs across all the distances we raced. 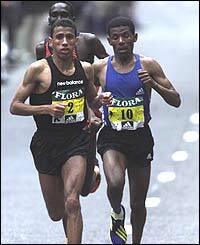 When I look back on Haile’s early-to-mid-90’s races, two things about Haile stand out in my mind. The first was his unwavering smile. Before each race, the camera panned from competitor to competitor, each nervously toeing the line and clearly trying to mentally prepare themselves for the physical discomfort they were about to put themselves through. Then the camera would reach Haile and he would be sporting a massive smile, usually looking up at people in the crowd and waving. He never showed any signs of apprehension or nerves or trepidation for what was about to unfold. 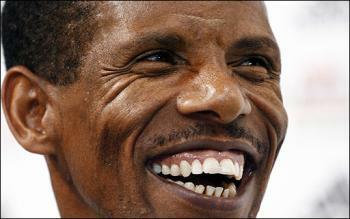 (An aside: only Wilson Kipketer springs to mind as another pre-race smiler from the 90s). The second thing that stands out, probably as his greatest characteristic on the track, was his vicious and insurmountable finishing kick. He would wait and wait and wait on the shoulder of whoever was brave enough to lead the race, and when the time came, and the time was usually when the final lap bell sounded, for him to unleash his kick, unleash it he did. He was gone. Many would try and live with the kick, responding with a kick of their own; and for perhaps the first 100m or 200m of Haile’s kick, they would be on him, and you’d think, could this be the one? But it never was. Eventually, sometimes after 100m, sometimes after 200m, sometimes even after 300m, the challenger would fade and Haile would be away. The final lap of almost every race he started would end with him enjoying the finishing straight all to himself, blasting along seemingly above the tartan. Smiling. And taking the win. 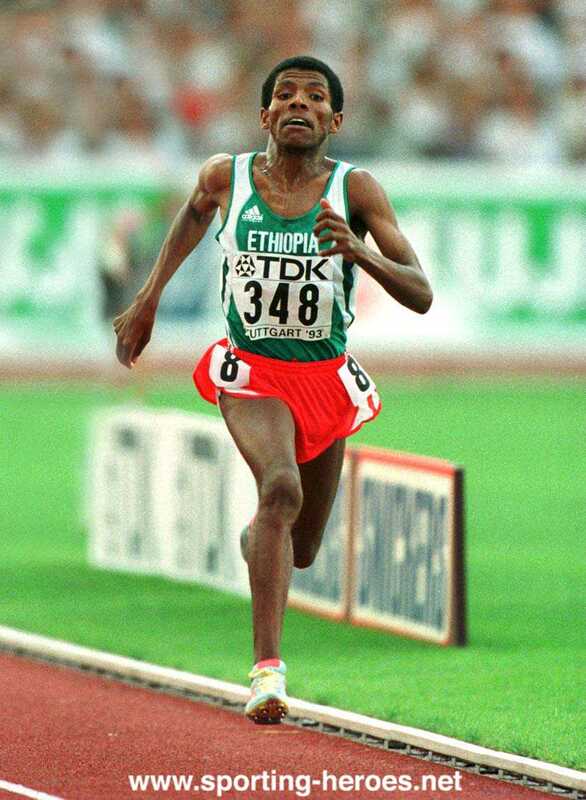 Haile had many fantastic races on the track, but if there is one that stands out, it is, as many many fans have already pointed out, his duel with Paul Tergat in the Olympic 10000m final in Sydney in 2000. I’m going to come right out and say I was supporting Paul on that day. 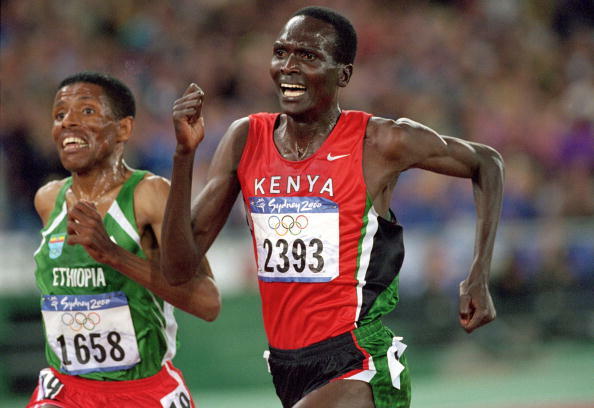 In any number of the vicious kicking races described above, it was Paul Tergat who suffered at the hands (legs?) of Haile. He was the perennial number two man on the track. His record on the country however was quite the reverse. He was Mr Cross Country in the 90’s. Dominating everyone for five world titles. Incredible record. But on the track it was a different story. He had never toppled King Haile on the tartan. That’s a tasty enough head-to-head on its own, but lets throw in a little more. They had both publicly stated that this was to be their final race on the track, both focussing on the road (and marathons) after the Olympics. More on that later. So this was effectively Tergat’s last chance to wrestle just one global track title from Geb. How was he going to set about doing it? He was going to try and beat Haile at his own game in one respect. That is, he was planning to unleash the mother of all finishing kicks. 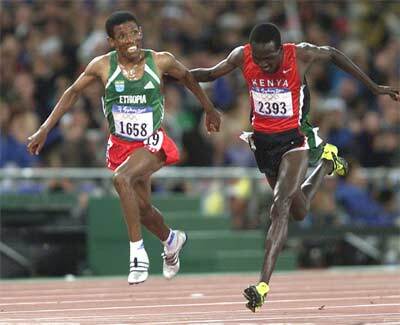 The kind of kick that would define the kicking ability of Messr Paul Tergat. Every bit of his leg speed would be deployed in the closing stages. Also, he was going to try and do it before Haile got going with one of his own. Race time. Let’s jump to 500m to go. The field is whittled down to the usual duo. Everyone else has cashed in their chips and called it a night. We go through the bell, the pace picks up from an already fast pace, it has been increasing for the last few laps in fact. Tergat goes. Haile responds. Haile eases past on the back straight. Doesn’t he? Doesn’t he? NO HE DOESN’T. Tergat is fighting with everything he has. This is his chance. He has been watching the Haile kick year after year and has had the chance to study it first hand on most occasions. Now it is his turn. He throws it down. The back straight comes and goes, the final bend comes and goes. TERGAT IS STILL IN FRONT! He has finally gotten on top of Haile’s finish. The man can be beaten. What a run. But hang on, 50m to go and they are inseparable! It’s a flat-out sprint now. It’s gone beyond a kick. Insane. The crowd is mental. Hairs on the arms and necks of running fans everywhere are on end. What the hell are we witnessing! There is 20m to go and it is still impossible to say who will win. It is the perfect and fitting finish to a pair of track careers and a rivalry that won’t be seen on the track again for many many years. It is the defining moment for both of their track careers. Who won? Oh yeah, Haile got it in the end. And he wasn’t smiling across the line, he was grimacing. So began the next chapter of Haile’s career. His road career and more specifically, his marathon career. Lets jump to 2002 and the London Marathon. Amazingly (or perhaps not surprisingly), Paul Tergat is also in the race. With a mile or two to go, the lead pack is down to a group of three. Khalid Kannouchi, Paul Tergat and Haile. The race has been marketed as Haile’s debut. Technically speaking it isn’t as he ran one when he was a teenager, managing a finish in the 2:40’s off very little training. But really, to all intents and purposes, London 2002 was his debut. He was probably looking the most comfortable of the three heading into the final mile. Looks, however, can be deceiving. Kannouchi, the world record holder at the time, dropped the hammer with a long push for home as they headed past Big Ben and Haile was dropped straight away. Tergat hung on for slightly longer before also being dropped. Kannouchi’s marathon experience and ability had won out on the day and he had a fantastic race, winning, and breaking his own world record in the process. Haile however, in his “debut” had managed an amazing 2:06:35 for third. It was confirmation that he would enjoy some success over the marathon distance, in the years to come. 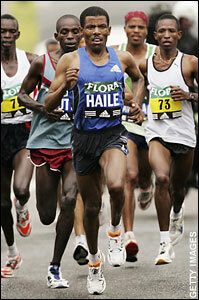 In my opinion, that 2002 London performance was to be Haile’s best marathon showing in a world class competitive field. He had some London disappointments after that, with a DNF and a lower placed finish. But it was to be in even-paced marathon races, on fast courses with publicly stated attacks on the world record that he carved out his road niche. He raced in Europe, in Amsterdam first and then in Berlin, where he was to achieve his best results time-wise, with TWO world records. 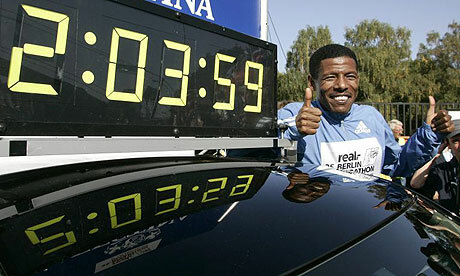 The second one, still standing, with Haile the only sub 2:04 man in history, at 2:03:59. He also dominated the Dubai marathon, chasing the world record but falling short, albeit with world class times, on three occasions. During these times, it would be remiss to say he enjoyed the global adoration he had on the track. There was a small, but growing group of athletics fans who began to feel Haile was cheapening marathon racing in a way, by targeting fast races, ensuring no serious challengers were present so he was secure in the win, and then attempting to time-trial his way to a world record. It was, and is, a hotly debated and contentious discussion. Splitting fans down the middle. Whatever you believe, it has to be admitted that Haile never managed to win a marathon with a world class field present. London he tried, Boston he never raced, the Olympic marathon he never raced, and we all know how New York went. That is not up for debate. What is up for debate is whether this was showing him to be weak or cowardly or a dodger, as the naysayers may have you believe. My personal take is no. Whilst it is disappointing he never succeeded in a world class marathon field, I think it is disrespectful to suggest he dodges competition, given his track pedigree. He was the ultimate racer on the track. He was there to win, the time was secondary. That he broke so many world records en route is an indication of his unbelievable natural ability and gift. He raced all comers on the track year after year and proved himself against them year after year. Why should he necessarily have to take that same route on the roads? He chose to run marathons focussed on achieving fast times. He didn’t actively dodge world class fields – his number of attempts in London, which undeniably puts together the toughest field in the world year after year, are an indication that he did try and pit himself against the best. Unfortunately he never achieved the success that he aspired to in that area. Running fast times became his speciality and you can’t deny he did that better than anyone. And so we come to his unexpected retirement announcement. Out of the blue, after being forced to drop out 16 miles into New York on Sunday. Turns out he had been carrying a knee injury and had had an MRI scan and fluids drained on the Saturday before. He shouldn’t have started the race. But he did. Perhaps he was feeling the pressure from the naysayers and the media on him to deliver in a quality marathon field. So he started. And the rest we know. A final thought on his retirement. He made the decision and statement extremely soon after the race, when perhaps he was a little emotional, with disappointment, frustration, and sadness uppermost in his thoughts. To suggest he can no longer perform at the highest level is flat-out wrong. He ran a 59:30 half marathon in the Great North Run in September this year. Third fastest time ever on the course. He still has it. If he wants to carry on. Let’s wait and see. I’m hoping he reconsiders. For me, the best platform for him to show off his wares, is, was and always will be the track. On that surface, a racer, a record setter, a title winner. And all the while a humble gracious and smiling man. Great article. Remembered seeing him run the african athletic champs 10k in Durban in 1993. Thought you and Flip were there too? or maybe it was just Daryn…? Anyway thanks for a great read. Hey Slick. I wasn’t in Durbs that year. Wish I had been though! I first saw Haile in the flesh many years later, at an indoor meeting in Birmingham. I saw him there a few times actually, around 2003, 2004, 2005-ish. Each time targeting a particular WR. I think I saw the indoor 5k record attempt and the 2 mile attempt. Awe inspiring being up close to history in the making. Fantastic tribute Mince. Your references to our early years of running were right on the button. We were young, passionate and lived and breathed running. Nothing else mattered. We needed someone to represent everything that running meant to us (someone with talent as opposed to our achievements which were purely a function of hard work). That ‘someone’ was “The Emperor’ himself. The man is simply a legend – undoubtedly the greatest professional athlete that ever lived. Armstrong will have questions for the rest of his life. Woods is an idiot. Even Ali had a personality that didnt earn him respect. Geb was none of these. Just look at how he invests all his winnings in building a sustainable business empire back in Ethiopia, creating jobs for hundreds of people. There isnt a selfish bone in his body. All the criticism about time trialing select marathons as opposed to ‘racing’ the big guns misses the point completely. Firstly, his marathon success is way more than records and podium finishes. His success feeds thousands of Ethiopians every day. Damn right he chooses his races carefully. And secondly, anyone who holds 5 of the 10 fastest marathon times in history has earnt his respect. Critics can f*** right off! Thanks for the memories my friend. Gebs retirement is a catalyst for you and I to reflect how our lives have meandered along in close companionship all these years. We’ve seen the best and worst of each other and I’m lucky to have you as one of my closest mates. It helps that my wife loves you to death, despite having spilt about a litre of beer on her carpets over the years……. Armstrong will have questions for the rest of his life. Woods is an idiot.